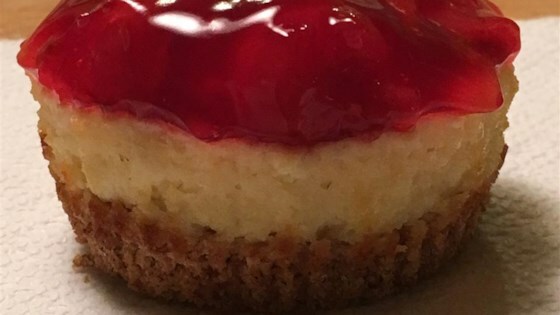 "These miniature cheesecakes with graham cracker crusts and rich cherry topping are absolutely the best!!!! You just can't have one. It's a hit at every gathering!" Preheat oven to 350 degrees F (175 degrees C). Place cup cake liners into muffin tins. To Make Filling: In a medium bowl, combine cream cheese and 1/2 cup sugar. Stir in eggs, vanilla and lemon juice. Mix thoroughly. To Make Crust: Combine crumbs, 2 tablespoons sugar and cinnamon. Cut in butter until crust forms small crumbs. Put one spoonful of crust into each cup cake liner and pat it down. Spoon a layer of filling on top of crusts. Bake in preheated oven for 30 minutes. When tarts are fresh from oven, spoon cherry pie filling over top of each. Let tarts chill in refrigerator for 30 minutes to an hour. See how to make a deliciously simple cherry-filled pastry. Great recipe, I used cup cake size liners, I doubled the recipe hoping to make about 40, only made 26ish....so if you are wanting more, you may need to triple the recipe. It's a keeper. I've been making these for years but instead of preparing a crust, we use a vanilla wafer on the bottom of the cup. Very quick and easy way to serve little cheesecakes. put thick layer of cream cheese mixture. Just like the cherry tarts my mom used to make! Was perfect, the only thing I changed was we did not use pie filling. We just took cherries out of the jar and put on top, along with a little of the juice.